"As someone who has worked in social service agencies, consulted with hundreds of them, and who teaches social service professionals, Ms. Summers knows the issues faced by agencies firsthand. From this experience she has compiled a thoughtful and well–organized text that identifies the principles of effective supervision." The care of patients and clients of social service agencies is increasingly being performed by paraprofessionals or professionals with little experience. While there are many books written about giving quality clinical supervision, there is very little on supervising the least experienced frontline nonclinical and clinical staff to teach and promote positive and effective interaction with clients, and provide staff support and training that elevates quality care, improves job satisfaction, and minimizes staff turnover. 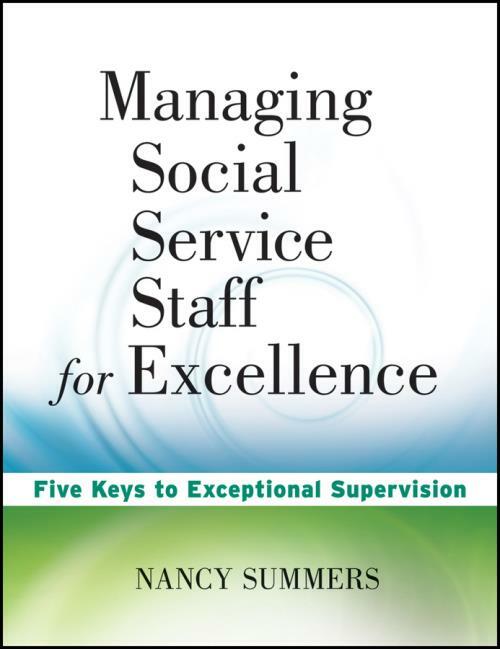 Based on author Nancy Summers′ many years of working with troubled social service agencies, Managing Social Service Staff for Excellence: Five Keys to Exceptional Supervision fills this need and offers numerous ideas for securing the best care for those served by social service agencies. Common problems faced by agencies are examined with regard to employee behavior and wellness, including staff teamwork, how to build healthy staff/client relationships, and the identification and prevention of routine disrespect of clients and their needs. Diagnostic techniques are presented for identifying these problems, as well as remedies and prevention programs that can be put in place without great expense. Filled with interviews and numerous case examples, Managing Social Service Staff for Excellence offers a step–by–step process for: creating good preventive measures to counteract negative practices that can occur; developing robust commitment and enthusiasm; and getting back on the right track after unfortunate incidents have taken place. Chapter 1 Key 1: Apply What We Know. Chapter 2 Key 2: Connect the Employee to the Mission. Chapter 3 Key 3: Build a Support Structure. Chapter 4 Key 4: Be a Leader. Chapter 5 Key 5: Promote Success. Chapter 6 Bad Apples and Underdogs. Chapter 7 Enmeshment: The Worst–Case Scenario. Chapter 8 How to Correct a Bad Situation. Chapter 9 Building a New Team. Chapter 10 Building and Maintaining the Foundation: The Administrators Chapter. Appendix A: Sample Mission Statements. Appendix B: Ideas for Employee Handbooks and Orientation. Appendix C: Differences between a Professional Relationship and a Friendship. Appendix E: Consumer s Family Survey. Appendix F: How to Write Goals and Objectives for Individual Consumers. Appendix G: Conducting a Mini Analysis. Appendix H: Online Resources for Administrators and Supervisors.